ASIC has lauched a market place lending survey to help capture the industry data from 2016. We encourage lenders to participate in this research as transparency helps to engage regulators in a positive way (which is supported in many leading markets such as the UK). It is the news we've been waiting for! Treasury has proposed legislation for small business crowdfunding, via the company structure that 99% of businesses use, i.e. the proprietary company. It is great news, however we are yet to digest all the differences and implications, including the removal of concessions for Public companies that use CSF! Upfront establishment of a public company was always going to be a big deterrent, due to the cost (ASIC fees, legal, accounting and compliance). Keep in mind that the pty ltd is only a proposal, so it will take at least another 9 months to become law. The CFIA enquiry line is open, and too often we end a call, thinking 'I must write that down'. ​We asked; Consider your expectations; are they including general PR, marketing, customer base? If that’s the case, the a campaign is usually worthwhile, even as a test bed exercise. If you are simply looking for funds it’s rarely the right place to start. Remember; the first rule in crowdfunding “you bring the crowd”. Invariably, people you don’t know will only back a winner. Be sure to secure insider support or you are at risk of falling flat, fast! Be sure to work out what you are targeting. Is it donations (or quasi donations), or is it about the product(s)? Get inside the backers heads and be cynical. If I part with my funds, what’s going to happen? What’s the risk? What does it say about me? Keep in mind the size and activity of your social base. When we looked at flow hive, they had 1000’s of likes, and hundreds of shares, and that was before they launched the campaign. Get into PR mode, and be edgy. People need to get on-board with your journey and be keen to share it with others. Federal parliament approved a modified version of the Equity Crowdfunding Bill first put forward in November 2015. The bill ushers a new, regime for Public companies to fundraise small amounts from retail investors via approved AFSL holding intermediaries. For many retail investors this will be the first time they have access to offers that have been traditionally reserved for exempt investors, affiliates or employees. Congratulations to the minister for personally championing the bill to fruition, and we trust that further progress will be made in regards to the SME friendly version currently under review. Lets crowdfund Equity in 2017! The Federal Association of Crowdfunding eV is committed to the highest professional and ethical standards in the German crowdfunding industry. Professional and ethical behavior is fundamental to the success of the crowdfunding industry. The market participants depend on a trustworthy environment. Investors, capital-seeking companies and persons as well as all other market participants are allowed to expect the members of the Federal Association Crowdfunding eV to behave to a high degree professionally, transparently and ethically. In addition, it is in the best interest of the member companies to support the development of confidence in crowdfunding, crowding and crowding in the public through appropriate behaviors. Against this background, the Federal Association of Crowdfunding eV has developed the following Code of Conduct. The principles are designed to be applicable to all member companies, ie to both the BaFin-authorized crowdfunding platforms and other companies. The members of the Federal Association Crowdfunding eV are of the opinion that the principles formulated in this Code of Conduct are important for both companies and private individuals. Compliance with these principles is an essential prerequisite for membership in the Federal Association of Crowdfunding eV Each of these principles applies to all members of the Federation of Crowdfunding with regard to their investors and donors, as well as with regard to companies and persons seeking capital. 1. We keep investments and donations generated through our platform separately from the cash flows of our operating activities, ie in customer accounts or similar separate structures for capital management. 2. We ensure transparency so investors or donors can receive information about their money invested or donated. 3. We create processes that ensure the secure storage of the data of our investors, donors and capital-seeking companies, persons or projects. We comply with all data protection regulations in force in Germany. This also means that access to these data is still possible when our business is discontinued. 4. We create processes that ensure investors' access to their holdings in the event that our business is terminated. 5. We agree to allow investors or donors a consideration period if they change their mind following an investment or donation. 6. We formulate our general terms and conditions and contracts for companies and individuals, investors or donors in an understandable manner and explain exactly how the investment process and transfer process works, what our rights and obligations are, what due diligence applies to us and what fees and at what time To be due. 7. We hire competent, professional and serious staff and ensure that we have the necessary systems and processes to conduct our business in a secure manner. We present our management on the website of the Federal Association Crowdfunding eV. 8. We ensure that our IT systems and business processes are secure and reliable, that they comply with the nature, scale and complexity of our business, and that they are sufficiently sound to comply with the applicable laws and regulations and this Code of Conduct. 9. We comply with the laws and regulations applicable to our sales and marketing activities and ensure that our communications are fair, comprehensible, transparent and in no way misleading. Risks and potential returns are presented in a balanced manner, while investors and donors are treated fairly. 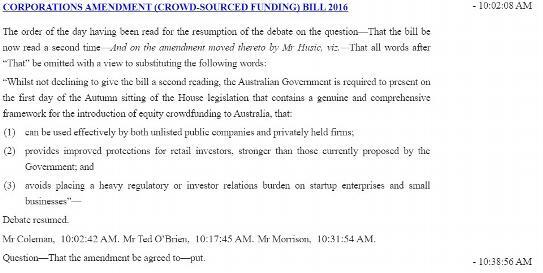 The senate agenda's been updated to call for the 3rd reading of the corporations law amendment bill, aka equity crowdfunding bill. Ed Husic MP unsuccessfully called for changes to the bill, though that attempt was voted down by the house of reps. See the attached amendments and make your own judgment. Meanwhile, the senate economic committee is tasked to review the bill amid turmoil surrounding the defection of one of the 6 senators (to start the Australian Conservatives party). Never a dull moment in Canberra, and it seems awkwardly timed to coincide with the rough progress of these much needed amendments. If you are new to the CFIA or don't visit the site often you might not have noticed the subtle changes we have made. In fact the entire site has been migrated to a new, easy to use format. It's so easy we could cry! Those happy tears are the simple joy of communication, flexibility and opportunity. Anyone connected to the exec team at the CFIA can blog on these pages. Join in, and share your crowdwise stories, updates and insights.